Myanmar Language Conjunctions known as သမ္ဗန္ဓ | thun2-bun2-da1 are words that connect other words or sentences. They are used to join similar items or meaning to show inclusiveness or continuity just like "and", "with", "moreover", etc. in English. They are also used to show contrasts such as "however", "but" and "nevertheless". Sometimes, they are used to express constraints and challenges like the English words "despite" and "in spite of". Conjunctions are also used to show "or else" choice, logical consequence such as "therefore", and "as a result", or to describe the desired end result such as "in order to" and "so that". Unlike particles and postpositional markers that are challenging topics to explain to the non-native Burmese speakers, conjunctions are relatively simple and similar to English. Once you get used to the word order which is opposite from English in many cases, you will find those easy. Knowing the meaning of the phrases and sentences at ease (without thinking) will give confidence to construct new sentences on your own. နားလည်အောင်ရှင်းပြမယ်။ | na3-leare2 oun2 shin3-pya1 meare2 -- [I will] explain [it] so that [you] understand. The above spoken phrase shows the usage of conjunction အောင် | oun2 "so that" or "in order to". Also note that the word order is different from English and "You" and "I" are omitted. နားလည် | na3-leare2 means to understand. It is a compound word made up of နား | na3 meaning "ear" and လည် | leare2 meaning to be shrewd or to be clever. In another words, to make the ears clever. ရှင်းပြမယ် | shin3-pya1 meare2 -- I will explain it. As lessons progress, there will be more complex sentence constructions. The material presented here is checked against Myanmar language grammar text books published by the Ministry of Education for accuracy and correctness. You will always see or hear literary form of conjunctions in formal speeches, announcements, news and in the written language. Understanding those words differentiate you from the illiterate in the Myanmar Language. The spoken form of conjunctions with the same meaning are shown as [colloquial]. ပုဒ်အချင်းချင်းကိုဖြစ်စေ၊ ဝါကျအချင်းချင်းကိုဖြစ်စေ၊ အဓိပ္ပာယ် အချင်းချင်းကိုဖြစ်စေ ဆက်စပ်ပေးသော စကားလုံးကို သမ္ဗန္ဓဟုခေါ်သည်။ -- Word that connects either other words or sentence or meaning reciprocally is called conjunction. § 13.1. In the above definition of conjunction, conjunction word ဖြစ်စေ | pfyit say2 - either ... or ... or is used three times to connect the words to form a sentence. § 14. Conjunctions are classified into 3 types by type of join and 11 types by meaning. ဆက်စပ်ပုံအရ သမ္ဗန္ဓ (၃)မျိုးနှင့် အနက်အဓိပ္ပါယ်အရ သမ္ဗန္ဓ (၁၁)မျိုးရှိသည်။ -- By means of connection, there are three types of conjunctions and by meaning, there are eleven types of conjunctions. § 14.1 In the above sentence, the conjunction နှင့် | hnin1 is the AND word which joins the words describing "three types" and "eleven types" of conjunctions to form a complete sentence. § 14.2.1 ပုဒ်ဆက်သမ္ဗန္ဓ | poat-hset thun2-bun2 da1 -- Conjunctions that connect words. Further analysis will show that they follow nouns and pronouns such as things, objects and people. Note that there are two နဲ့ in the above sentence. 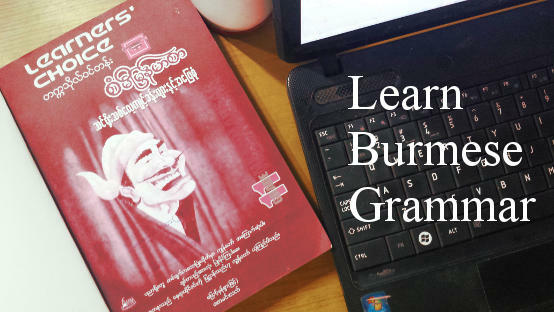 The final ending word နဲ့ is not a conjunction, but a particle meaning "Don't". Similarly, the word နဲ့ in the sentence below is not a conjunction, but a postpositional marker showing utility, i.e., "using" something to do something. Note: The conjunction မှလွဲ၍ | hma1 lweare3 yway1 may also be used in place of မှတပါး | hma1 ta1 ba3 in the above sentence. Note: Colloquial conjunction ကလွဲလို့ | gah1 lweare3 lo1 may also be used in place of ကလွဲပြီး | gah1 lweare3 pyi3 in the above sentence. Note: Colloquial conjunctions ရော | yau3 and ကော | gau3 are interchangeable. § 14.2.2 ဝါကျဆက်သမ္ဗန္ဓ | wet-kj11-hset thun2-bun2-da1 are conjunctions that connect simple sentences known as ဝါကျရိုး | wet-kja1-yo3. When this type of conjunction is used, the ending postpositional marker of the first simple sentence such as ပြီ and သည် are removed and replaced with the conjunction. In some cases, there is a tone change to the ending postpostional marker of the first simple sentence. E.g., သည် becomes သည့်. In effect, they connect simple clauses. The conjunction ၍ | yway1 can also be used to connect two activities one after another as shown in (CD1) below. Note: Fried Melons are served on top of Burmese Fish Gravy Rice Noodle Mont Hin Kha. They don't stay crispy for the whole day and they are usually sold out early in the breakfast time. Note: The word က was used earlier in (IJ3) as a conjunction connecting action and consequence. But, in (N), it is a postpositional marker showing the subject "honey". Note: For decades, budget is the main constraint in providing 24/7 electricity in this country. Myanmar is expected to be sufficient in electric energy for the whole country in the year 2030. § 14.2.3 အဓိပ္ပါယ်ဆက်သမ္ဗန္ဓ | a-date-peare2-hset thun2-bun2-da1 are characterized by two separate sentences in which the second sentence starts with a conjunction word that has logical connection to the first sentence. English equivalents are "Therefore", "However", "In addition", etc..